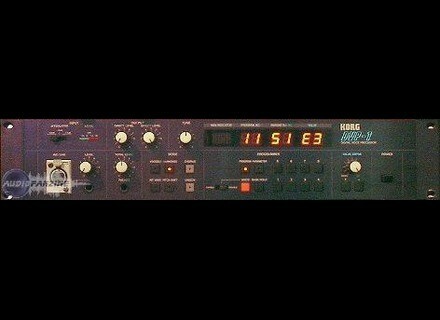 DVP-1, Other Effects Processor from Korg. The DVP 1 is not only a vocoder is a digital processor for the human voice, which can create plenty of effects, sometimes bizarre and amazing, and harmonizing voice polyphonic make it! This Korg offers 3 modes that will aim to treat the voice in different ways. There is a fourth mode that call Korg Internal Wave is a memory that stores waveforms, from them, you can create vocoder effects without using the microphone. Harmonizer mode allows you to create totally original effects different from those obtained with the vocoder and patterns and waves. Note that in between the DVP 1, through the microphone, can be raised or lowered, and may be accompanied by 3 or 4 additional notes of + / - 1 octave from the tonic. The human voice is basically monophonic (except malformation! ..) Then becomes polyphonic and perfectly harmonized. No need to connect a Korg keyboard to determine the heights. Chord parameters can be edited to define the degree of change of the pitch. As for the Pitch mode Schifter, it shifts transpose the original note. The parameter 61 (Coarse) acts by semitones, if the value 12 is displayed on the screen, then the note is higher than twelve semitones therefore an octave. The 62 acts much more discreetly, by a hundredth of a semitone, mixing the direct outputs and effect, we get the votes in third, fifth, etc. .. The parameters of the module forming "methods common to the 2 monitors and corrects the stamp. Depending on the tastes, needs, voice can age, rejuvenate, to virile, feminized, one can easily spend a cavernous voice and monotonous than that of a boy's voice, though shrill. If you've used this type of device, you've probably noticed that some phonemes, especially consonants emerge poorly, unlike vowels that they, quietly issued air very well accept the changes. To improve the intelligibility of the vocoder effect and maintain overall clarity, Korg to think it was better to let the consonants around the machine so they can emerge intact. Breath with Bypass function, we can choose the threshold frequency and volume so that the consonants are not affected by treatment, and it's really good and very efficient. The results can be even better and more convincing if we use the envelope generators controlling the volume (DCA-EG-Attack and Release) and pitch (Pitch EG Attack and Decay). You can also add vibrato and tremolo to the voice rigged (module MG) with adjustable frequency and depth of modulation and time delay, which further enhances the natural. I use a DVP for many years and I am very happy! Surely there are better, but throughout these years of use I got used to it, and I have yet to find a replacement worthy to name ..